Time for some dodgy Nineties music now. Timmy T was born as Timmy Torres in Fresno, California on September 21, 1967. 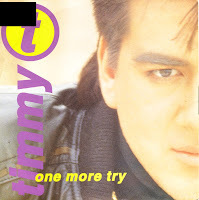 He released his biggest hit 'One more try' in 1991. The song was written and performed by Timmy himself. The inspiration for the lyric was the breakup with a girlfriend. Nothing really shocking there. But here is comes: when you listen to this, you will hear the cheap, tinny sounds and the low production standards of the track. You would think this would have been a minor hit, but instead this track topped the charts in America and the Netherlands. Only the people in the UK were sensible: there, the single did not chart. And why did I buy it? Dunno. Must have been a blackout.